We don’t just do reports. We share real-time reports. While everyone claims their report to be real-time, ours actually is. If a customer can’t find an email in the mailbox, then you need access to detailed logs on what actually happened. Whether the email was delivered or not? If not, why did it bounce? We always try to give you that little extra, so that you have access for a longer duration! 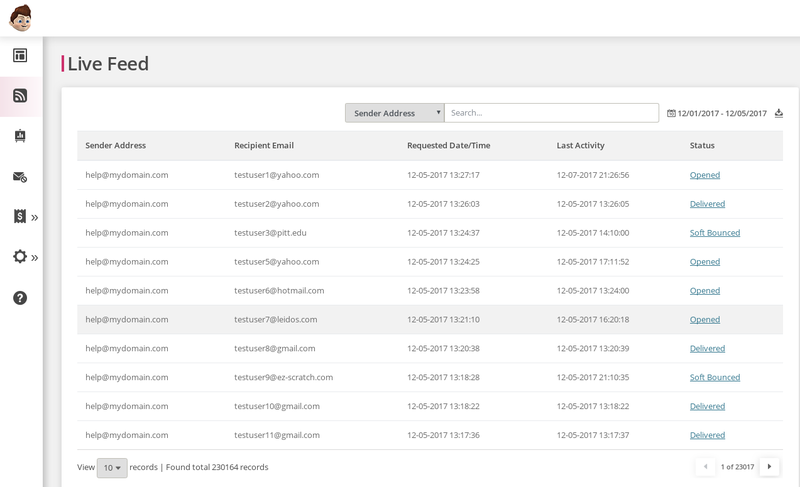 You can filter by status, tags, or date and view the activity history for all messages sent to a specific email address. With our Stats API, it is easier to keep creating backups of the older data at your end. Pepipost gives the option to tag each of your emails into a category. This helps you differentiate between “signup confirmation emails” or “forgot password emails” or “invoices emails”. Once the emails are tagged, you will be able to measure the performance across the different categories of emails. While it is always good to track data at the most granular level, sometimes the high level data tells a different story. This is exactly why we not only give you real time access to email logs, but have built reports. For example, the open or unsubscribe trend for a specific time period or for a specific type of email. If you are a pro user and looking to manage multiple accounts under one parent master account, then our Subaccounts feature is for you. Both the master and its subaccounts can access detailed reports on delivery, opens, clicks, bounce etc. Find out more about Subaccount Management. Real-time reports give visibility and insights on every email’s performance, as it happens. Next up is Webhooks! Let’s show you just how Real-Time we can be!